The beautiful blue mountains! There’s more to these mysterious mountains than you think. 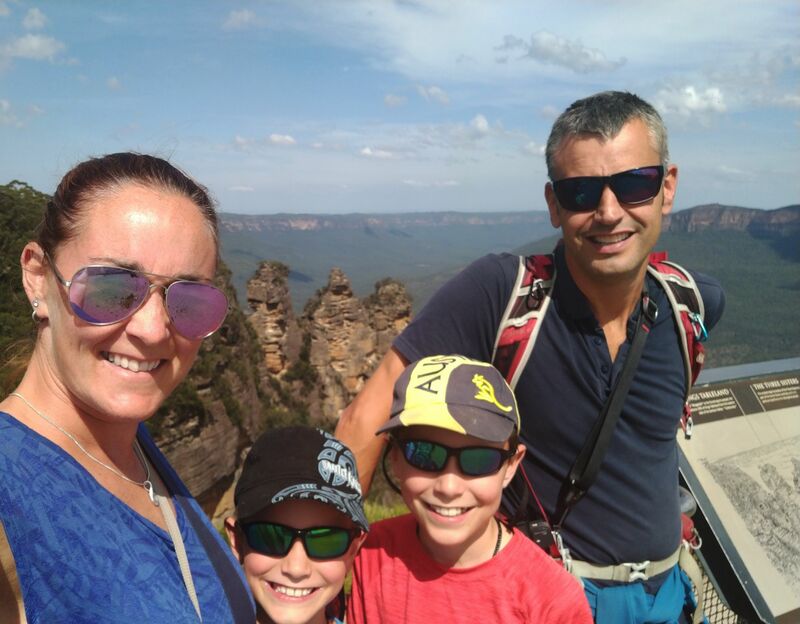 We spent 2 days exploring in the blue mountains with kids. We could definitely have spent longer and hiked more if time allowed. The area has such natural beauty and was reminiscent of our time in Zhangjiajie, China. As you’d expect, from a national park, the activities are mainly outdoors, so check the weather before you go. 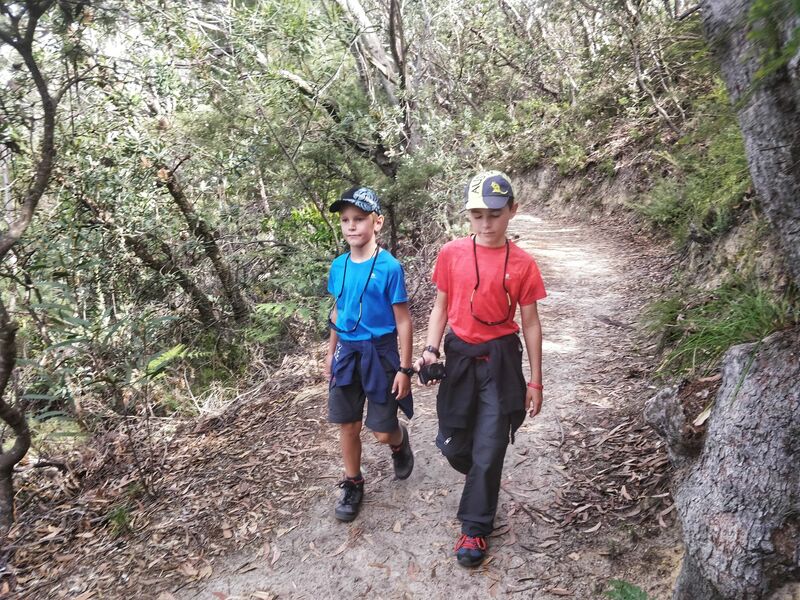 There are lots of family friendly trails and for those less able they can make use of the scenic world transport. 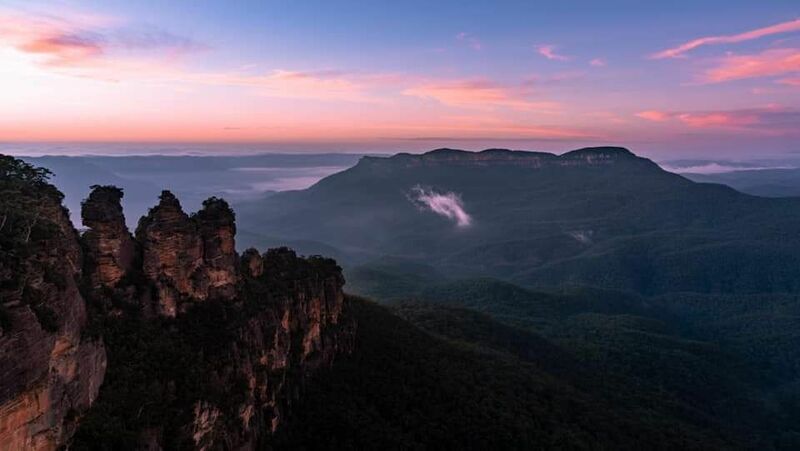 The blue mountain range is situated just 2 hours West of Sydney. You can either pay for a tour, hire a car or use public transport. If you are travelling from Sydney and considering using public transport. 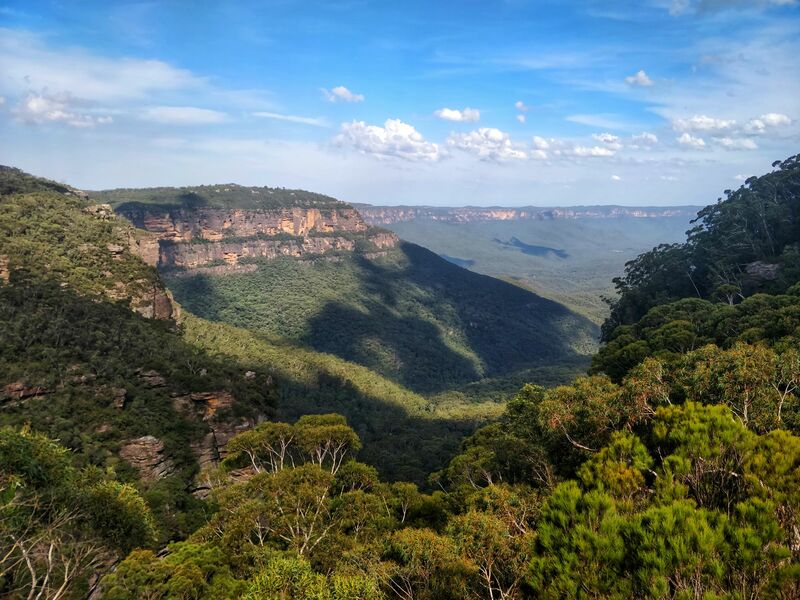 Then there is currently (February 2019) an opal travel deal where all public transport (including the blue mountains) is only $2.70 return on Sundays! Obviously this only means you get a day, but sometimes cost wins over time! Also, it may mean that sites are more crowded, but you can’t beat a deal like that! The best time to visit is March to May when things start to cool down! Summer is a great time too, but it gets quite crowded and hot. Whatever time you go, just keep up to date with local alerts. We visited in February and the temperature was a little warm, but most of the walks were under tree cover so made things a little more bearable when the sun was shining. Always check the weather forecast as the views are the most spectacular part of your visit so best to pick a day when you enjoy this the most. This is tourist central, so there are lots of hostels and motels. We chose to stay at Echo point motor inn , merely for the price and location. It was a stone’s throw from echo point and meant easy access to the main walks. Note: the main town of Katoomba is a little further away. 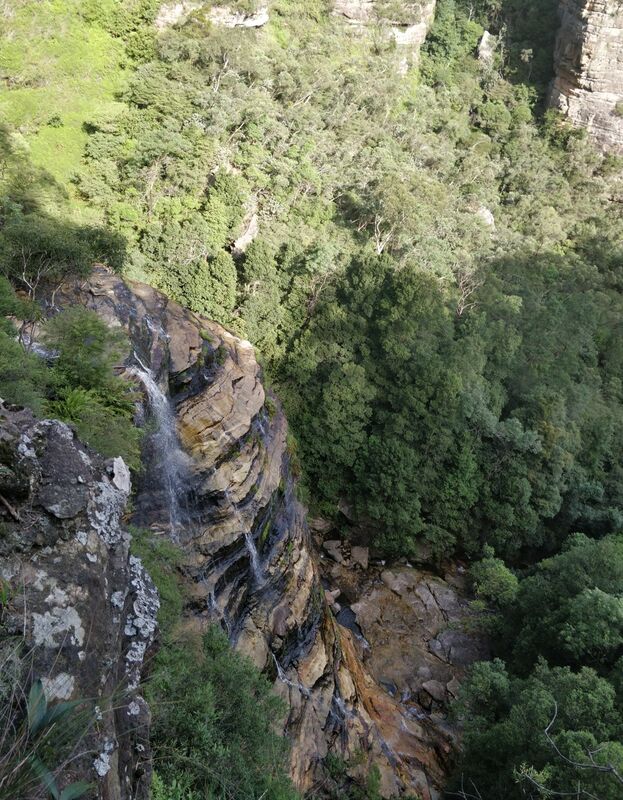 It’s approximately 30 minute walk from Echo point to the main shops. However, the accommodation was very simple and dated. There was a microwave and fridge, plus cutlery and crockery. But it wasn’t easy to cook meals in your room and there was no dining facilities. As we were on a budget and slightly out of town we opted for simple microwave meals and noodles for out extravagant dining experience!! All in all it was ok, nothing to write home about. Obviously first and foremost its all about the selfie!! Well that’s pretty much what saw. If you can’t beat em, join ’em!! Actually it didn’t surprise me to see most visitors just take photos and then get back on their bus 🙈. Anyway, that’s not the way we do things and so planned out some walks. But actually the boys were still shattered from New Zealand! Well, they were whinging anyway. Before going out – slap up, make sure you take plenty of water, some snacks and wear comfortable shoes. The paths are easy going but they are uneven so walking shoes are best. From echo point you head towards the three sisters lookout. From there you will see sign posts directing you along the Prince Henry cliff walk. There were lots of look outs, some with quite a scary cliff drop! 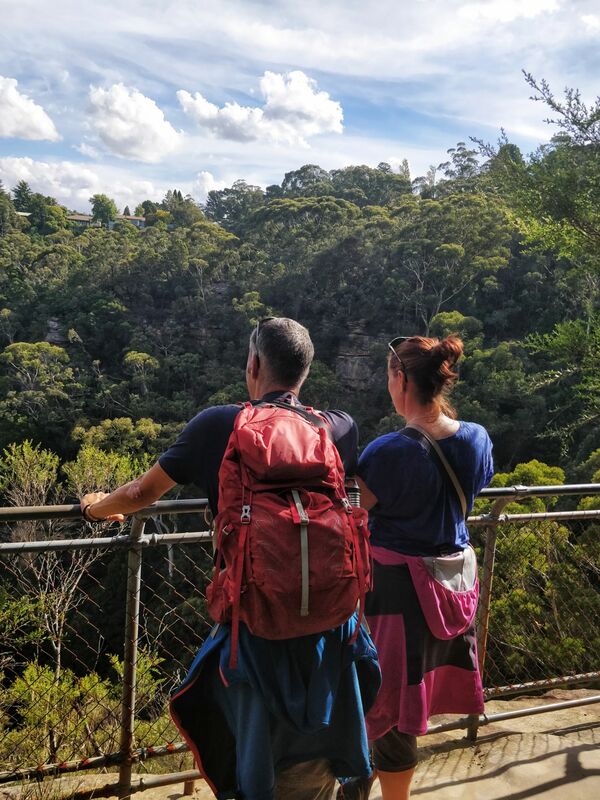 We only walked as far as Leura falls, but you can go further. This was about 6km. We walked the cliff path on the way out and the road on the way back (due to tired, grumpy children). From echo point, head in the other direction this time – towards scenic world. 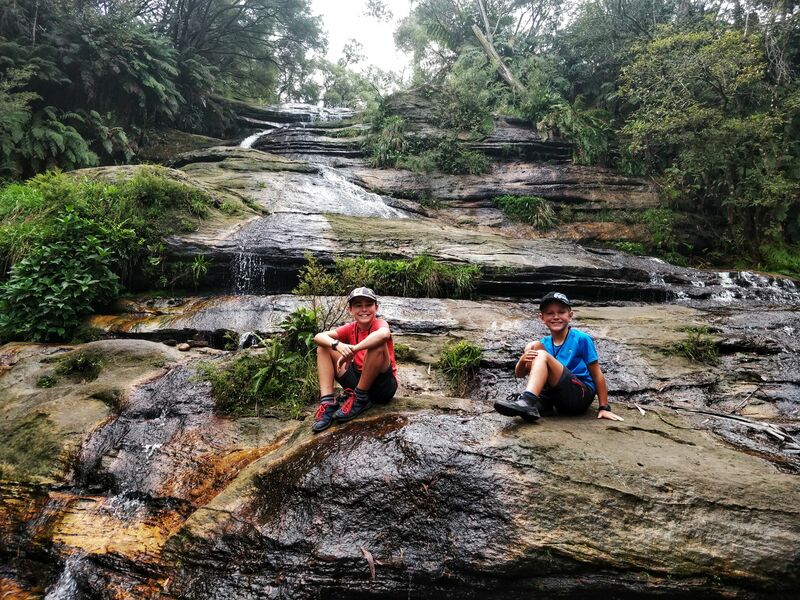 It’s a very gentle, with only a few uphill sections along gorgeous rainforest until you reach the falls. 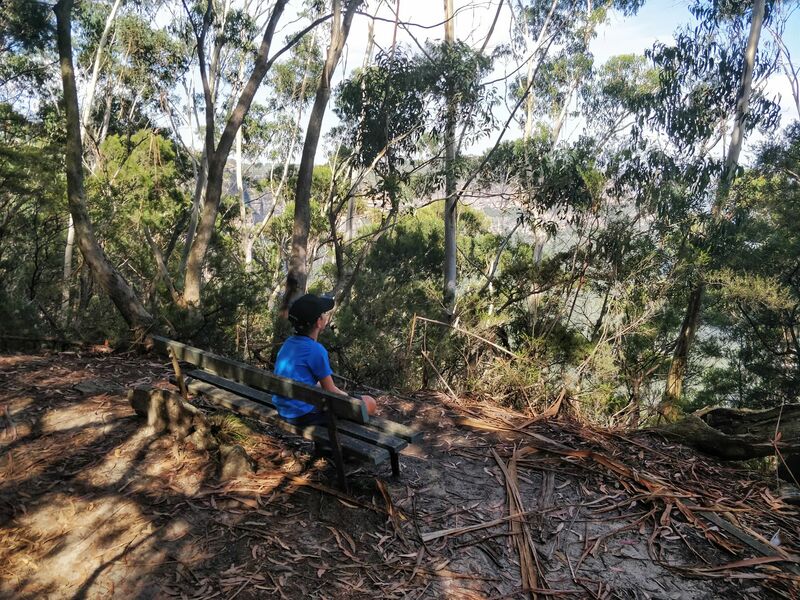 There’s a number of lookout points and you can see lots of native birds. The falls themselves are only small with a small pool, great for little ones to splash in. There’s 2 ways to do this. Either you do the lung bursting walk up or knee breaking walk down. Either way, it’s a pretty impressive 1000 steps to reach the rainforest path. We opted for down. We met a few hardy souls who were coming up and they were struggling! I felt like I was cheating going down! The walk itself is beautiful and you get to see the karts from the ground. The lush green foliage is a welcome break from the sun and even sheltered is from a little rain shower. Last time I walked here I managed to tear ligaments in my ankle!! I wasn’t going to do that again, so the kids were pleased with the slower pace! Once you reach the end you have the choice of walking up turner steps, which Keith did. 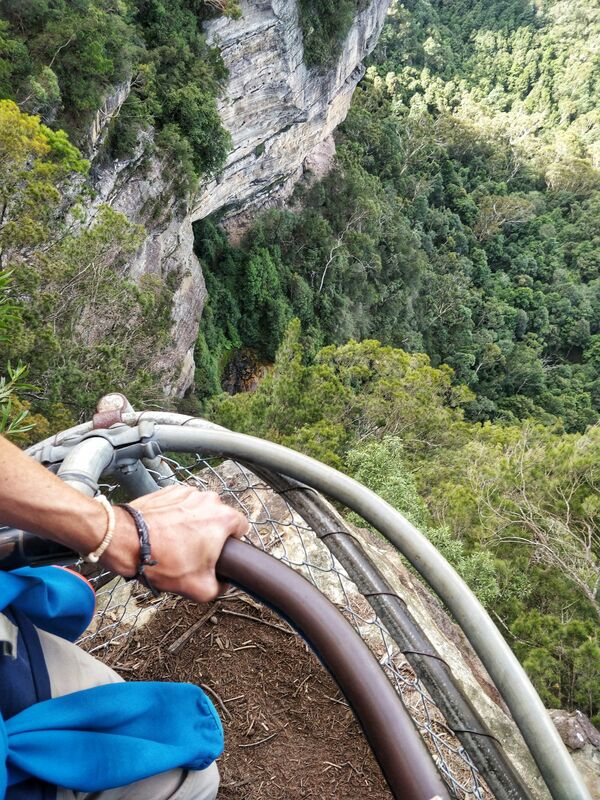 Or take the scenic railway – the steepest and scariest railway in the world. The kids and I opted for the railway and Keith walked!! I was a lazy bones and he was a cheap skate – ha ha! 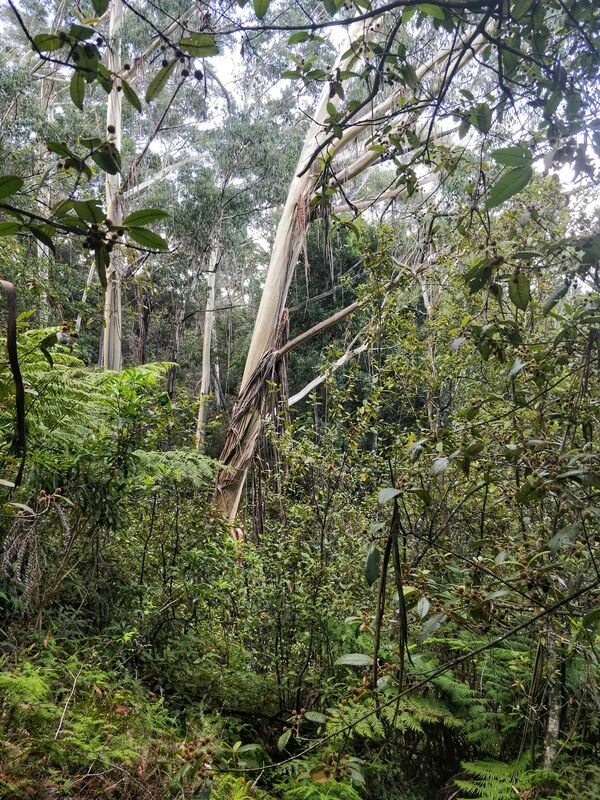 Scenic world – there are 3 scenic routes. You can travel over cliff tops to via the glass floor of the Scenic Skyway. 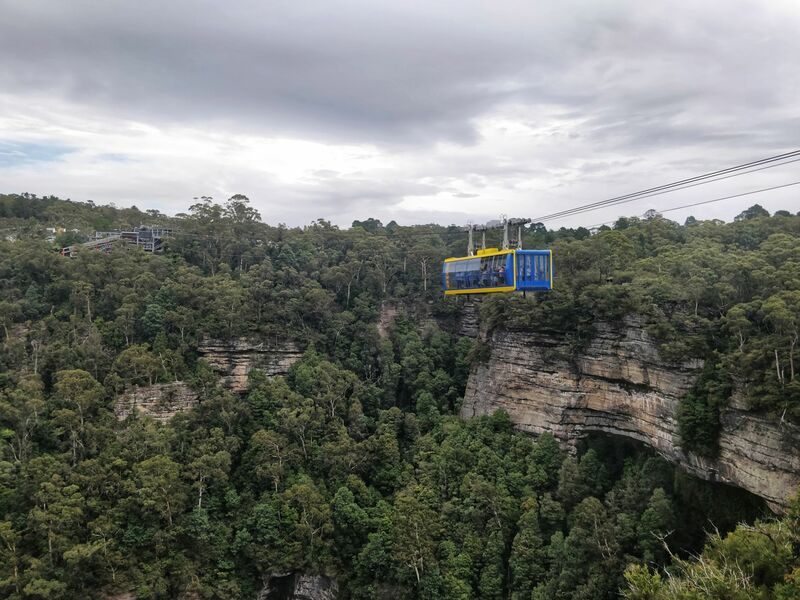 The scenic cableway which takes you to the scenic walkway. 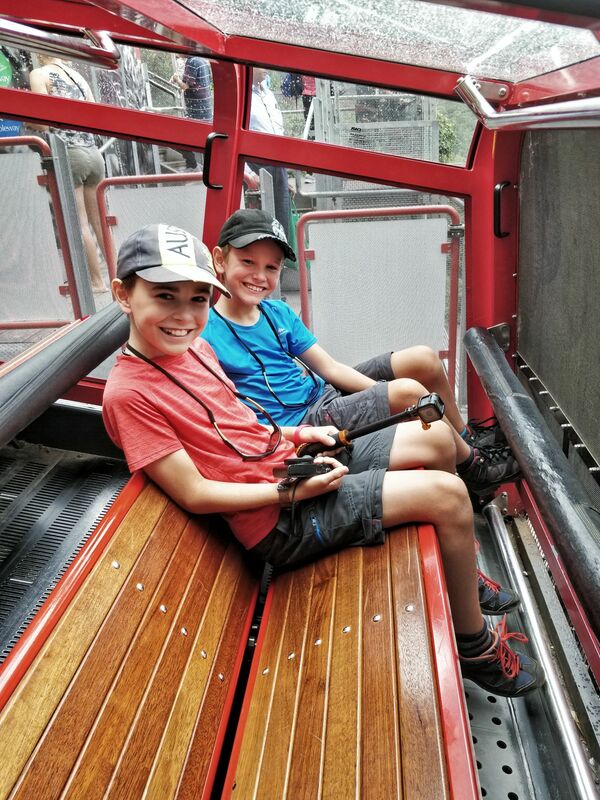 And the scenic railway – which is the steepest railway in the world! The price at $112 for a family day pass, was a little too high for our budget! There’s a range of tours available and different pricing. It’s about an hour’s drive from echo point. We’re an outdoor family and we love to explore and hike. The blue mountains was a firm favourite last time and although it feels like it has become more touristy you can still escape. 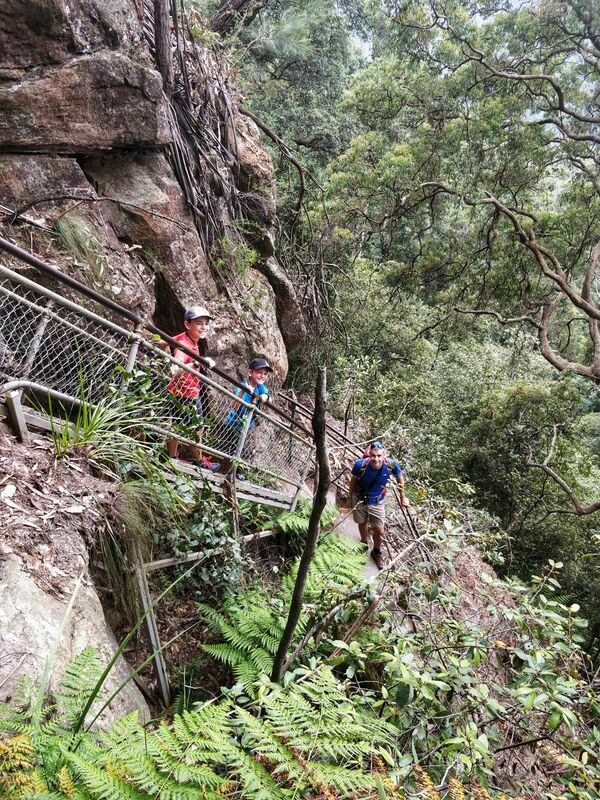 We found that most tourists hung around echo point and scenic world. 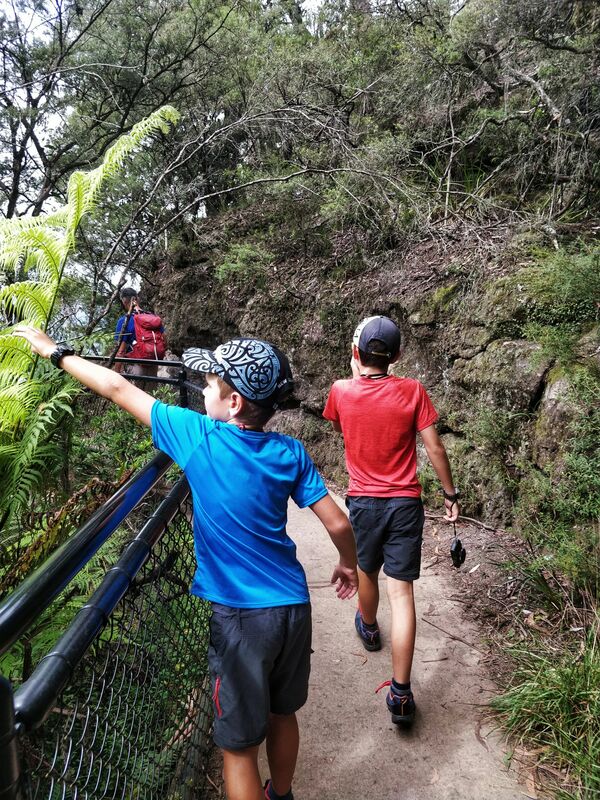 That meant that the trails are quite quiet and you can find your own peace and quiet… If that’s possible with kids! I also liked that there were a range of walks on offer to suit all abilities. Plus there were lots of viewpoints to keep the kids moving along! I’d recommend taking a pair of binoculars and/or a camera to keep the kids engaged.